We had a lot of great feedback in our Review This Box Of 2012 Panini Rookies & Stars NFL Player Of The Day Contest. There were diverse opinions and comments. The vast majority of comments were positive so it looks like Panini has done a great job with this year’s Rookies & Stars. My review will be revealed tomorrow, but right now I would like to announce our contest winners. We have 4 in total. Each winner will receive a prize I have selected from our Main Prize Pool. Here are the winners. We are back this week with even more chances to win prizes in our 2012 Panini America Player of the Day promotion. Last week we look at the top veteran Quarterbacks in league. For this week’s Panini NFL Stickers Players to Watch we will be looking at the top rookie Quarterbacks. You can instantly win prizes this week depending on how many of our Weekly Challenge Questions you get correct. I will be using standard fantasy stats from NFL.com to determine the winners. So here are this week’s Panini NFL Stickers Players to Watch. Card sets based on Americana tend to include a fun mix of humor and nostalgia, seldom featuring the other side of what makes America great, the people who rise up to represent the citizens of this country. With the bottomless pit of attention paid to news about entertainers, celebrities and Honey Boo Boo Child, it is refreshing to celebrate the people who’s accomplishments go beyond self interest and make us proud to be a part of this nation. 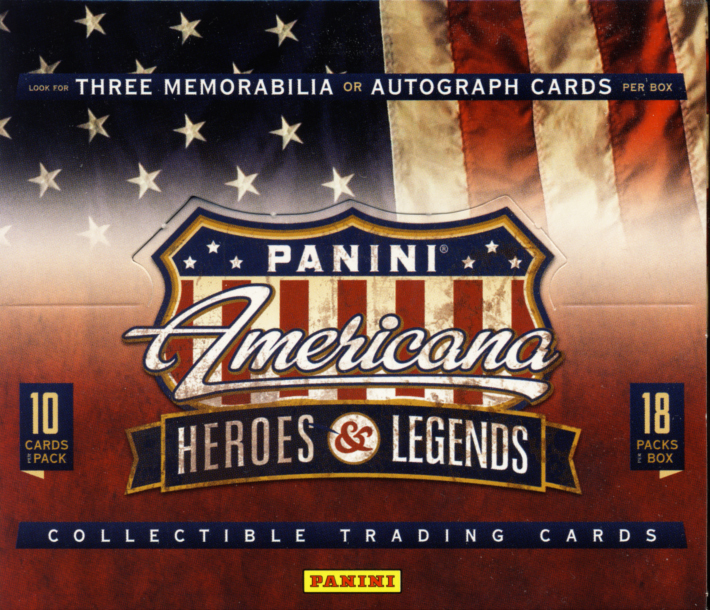 2012 Panini Americana Legends & Heroes takes a look at our Presidents, Astronauts, Tuskegee Airmen and members of our National Sports Teams and provides an important set collectors to consider building. 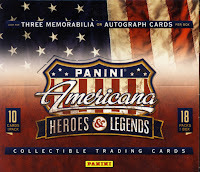 Panini Americana Legends & Heroes falls under our classification of trading cards. Hobby Boxes contain 18 – 10 card packs and feature 3 memorabilia or autograph cards. There are just a few hours before the final Presidential Debate of 2012, taking place in Boca Raton, Florida. In 15 days, voters will decide who will serve as President and Commander-In-Chief of the United States of America for the next four years. I’ve put together a video montage of the people who have served as President of the United States along with the years they were in office. No matter what side of the aisle you are on, my hope is that you enjoy this video and that you exercise your right to vote for your candidate of choice. All of the Presidential images used in this video are from the first 44 cards found in 2012 Panini Americana Heroes & Legends. I’ll have a review of the entire set some time after the debate concludes. As a reminder, while this mini contest is done for the week, the “Review This Box Of 2012 Panini Rookies & Stars” contest is still open, where you can win instant prizes and gain additional entries in our Main Prize Pool. You have until Wednesday, October 24, 2012 at 9:00 PM Pacific Standard Time to enter that one. This week we provided more opportunities to win prizes with our Challenge Questions. While no one got all 3 questions correct for a Perfetto, we did have 3 winners this week.